payilum – In this manner, due to emperumAn‘s infinitely great quality of simplicity leading to infinite affection for AzhwAr [towards emperumAn]; out of such overflowing affection, being situated in servitude towards bhAgavathas (bhagavAn‘s devotees) which is the ultimate stage of servitude towards bhagavAn, says that such servitude towards bhAgavathas is the goal to be attained for him. In seventh decad – Having become distressed after interacting with worldly people who have difficulty in accepting servitude towards bhagavAn, to be relieved from such stress, AzhwAr thinks that “serving emperumAn will not be sufficient, instead one should serve SrIvaishNavas who sustain themselves by such servitude, though they may be inferior by birth, actions and nature, still they are my masters, and I am their servant” and becomes joyful thinking about his relationship with them. emmA vIdu – initial stage of the goal; this decad – ultimate stage of the goal. Mercifully explaining these aspects, AzhwAr enjoys servitude towards such bhAgavathas who enjoy these qualities of emperumAn, along with those who are related to them. In seveth decad – AzhwAr thought about the nature of those samsAris who have no change in heart even after [Azhwar] mercifully explaining simplicity of bhagavAn in archAvathAram (deity form); when AzhwAr said in thiruvAimozhi 3.6.10 “thEr kadaviya perumAn kanaikazhal kANbadhenRu kol kaNgaL” (when will my eyes see the divine feet of krishNa who rode the chariot?”, emperumAn showed his devotees to him, who are explained as in periya thirvandhAdhi 31 “nizhalum adithARum” (like the shadow and the lines in the feet – inseparable), AzhwAr saw those SrIvaishNavas who are very receptive to bhagavath vishayam like a pit which can easily receive water, even without getting instructions from others; as his divine heart moves towards them, glorifying them “there are some noble ones”, he says “I am not a servant of sarvESvaran; but I am servant of SrIvaishNavas; even in that case, should I be servant of SrIvaishNavas directly; should I not just be a servant of descendants of such SrIvaishNavas?” and thus considers bhAgavatha SEshathvam (servitude towards bhAgavathas) as the goal and praises them [in this decad]. In “emmAvIdu“, AzhwAr established the goal in thiruvAimozhi 2.9.4 “thanakkEyAga enaik koLLum IdhE” (this act of enslaving me exclusively for him); but here, he explains servitude towards bhAgavathas as the goal; can prApyam (ultimate goal) be two? No. This [servitude towards his devotees] is also part of “thanakkEyAga enaik koLLum IdhE“; servitude towards bhagavAn means reaching up to the ultimate stage of servitude towards bhAgavathas. Whatever knowledge we must have, there is nothing remaining to be explained outside thirumanthram [everything essential is there in thirumanthram]; thirumangai AzhwAr too mercifully explained this (servitude towards bhAgavathas) as the meaning of thirumanthram; periya thirumozhi 8.10.3 “nin thiruvettezhuththum kaRRu nAn uRRadhum un adiyArkkadimai” (after learning thirumanthram, I realized that I am the servant of your servant); The purpose of thirumanthram is to explain the AthmA‘s ananyArha SEshathvam (exclusively existing to serve bhagavAn); that is to become a slave of his devotees [so he can even be sold by them]; “thadhbhakthinignamanasAm kraya vikrayArha:” (for SrIvaishNavas who have their minds being at the disposal of bhagavAn, to be sold and bought by them) and periyAzhwAr thirumozhi “endhammai viRkavum peRuvargaLE” (they can even sell me). When a land is property of a father, it can be sold by his son too; if it is not like that, there must be something wrong in the ownership of the father. emperumAnAr, while explaining “samsAra visha vrukshaysya dhvE palE hyamruthOpamE | kadhAchith kESvavE bhakthis thadhbhakthairvA samAgama:” (in the poisonous tree of this material realm, there are only two nectarian fruits; devotion towards krishNa which happens rarely and being together with his devotees only), he explained “vA” as “exclusive” and says “the goal [of kESava bhakthi] will naturally occur [when associating with devotees]”. The first stage of goal is to stop at servitude towards bhagavAn; the ultimate stage is to arrive up to servitude towards bhAgavathas. SrI rAmAyaNam ayOdhyA kANdam 1.1 “gachchathA” (one who is going) – for this emperumAnAr would mercifully say “The principle that is explained in ‘payilum sudaroLi‘ (this decad) and ‘nedumARkadimai‘ (thiruvAimozhi 8.10), SrI SathrugnAzhwAn demonstrated it practically”. [There is a question, how can thiruvAimozhi pAsurams be demonstrated by SathrugnAzhwAn who lived very long before the advent of thiruvAimozhi?] The principle explained here is based on thirumanthram; as that same principle was demonstrated, it can be taken as a demonstration for this decad also. perumAL (SrI rAma) taking birth as a principled person, demonstrated sAmAnya dharmam (basic principle) of obeying the words of father [elders] to show that “a son should obey the words of his father”; iLaiya perumAL (lakshmaNa) demonstrated that this should be observed in prAptha vishayam (bhagavAn) [i.e., one should obey/serve emperumAn]; SrI bharathAzhwAn demonstrated that “one should serve for the pleasure of bhagavAn” [unlike lakshmaNa who forcefully served SrI rAma at times]. SrI SathrugnAzhwAn demonstrated this in bhAgavatha vishayam [for devotees]. perumAL demonstrated “one should obey the order of father”; iLaiya perumAL demonstrated “one should obey the order of the real father [bhagavAn]”; that too, SrI bharathAzhwAn obeyed SrI rAma when he was told “stay in ayOdhyA” though he did not like it [and wanted to accompany SrI rAma] – he would not force SrI rAma saying as in SrI rAmAyaNam ayOdhyA kANdam 31.22 “kurushva” (you have to bless me [to accompany you]); SrI SathrugnAzhwAn demonstrated the ultimate stage of it [in the matter of devotees]. His nature is explained in this SlOkam (ayOdhyA kANdam 1.1). mAthula kulam gachchathA bharathEna nItha: – bharatha went considering his uncle’s family as the purpose of the visit; Sathrugna went considering bharatha as the purpose; yudhAjith (bharatha’s uncle) invited bharatha only. gachchthA – going along; as this word is “present tense”, it can be understood that, Sathrugna did not plan for it even moments ago; he did not get permission from SrI rAma or dhaSaratha chakravarthi [just naturally followed bharatha]. bharathEna – After perumAL discarding the kingdom, iLaiya perumAL followed him, dhaSaratha chakravarthi died and SathrugnAzhwAn does not know anything beyond bharathAzhwAn, since he was bearing it – he is called bharatha; bharatha ithi rAjyasya bharaNAth (bharatha means “one who bears the kingdom” i.e., who takes up the burden of managing the kingdom). thadhA – As he (SathrugnAzhwAn) is a prince too and his nakshathram (birth-star) is different, it would have been appropriate to leave on a different day that suits his birth-star; but he left along with bharatha on the same day considering that itself to be auspicious for him too. anagha: – sinless; in that capital town ayOdhyA, it looks like everyone else is living sinfully. That is – they all would have a tinge of rAma bhakthi (devotion towards SrI rAma). But can rAma bhakthi be said as sin? Though puNyam (virtues) is preferred more than pApa (sin), both are to be given up since both are hurdle for mOksham (liberation); similarly, here also, since it is a hurdle for the goal, it can be said as sin. Is rAma bhakthi a hurdle for the goal? Yes – when we look at the ultimate stage [of devotion towards bhAgavathas], initial stage [of devotion towards bhagavAn] is a hurdle. Sathrugna: – Not only he is victorious over the external enemies, he has also won over the internal enemies, that is, senses. That is, not looking at SrI rAma who is glorified as said in SrI rAmAyaNam ayOdhyA kANdam “pumsAm dhrushti chiththApahAriNam” (SrI rAma who captures the eyes and heart of men too); even when he goes to SrI rAma, he does it to please bharathAzhwAn only. What is the difference between “anagha:” and “nithya Sathrugna:“? anagha: explains that SrI rAma is not as pure as SrI bharathAzhwAn; nithya Sathrugna: explains that SrI rAma is not as enjoyable as SrI bharathAzhwAn. nItha: – He followed [was taken along] like a sword or a shadow. When one dhravyam (entity) is to follow another dhravyam, there should be mutual consent; though SathrugnAzhwAn is a separate entity, he followed bharathAzhwAn in a subservient manner like an attribute or true identity of an entity [which follows the entity wherever it goes]. prIthi puraskrutha: – Did he go along following the general tradition/rule of younger brother following elder brother? No; while being present in the capital city (or the palace), the service for SrI rAma is divided up into many servitors; but when he decided to travel to the forest, iLaiya perumAL went along to the secluded forest so he can perform all services as mentioned in “aham sarvam karishyAmi“; similarly, SathrugnAzhwAn was pushed from his behind by the great love of desiring to serve bharathAzhwAn fully. emperumAnAr explained the overall meaning for this SlOkam as “SathrugnAzhwAn became dear to perumAL by ignoring perumAL and became exclusively dear to bharathAzhwAn who was dear to perumAL”. This [the servitude of bhAgavathas towards bhagavAn] being the reason [to glorify bhAgavathas], all the glories which were previously explained [about being surrendered to bhAgavathas] will remain in tact; if not for this [devotion towards bhagavAn], having one chEthana (soul) towards another chEthana (soul) is like a raft with hole taking the help of a bigger boat [to have both the raft and the boat drowned ultimately]. If they acquire the state as mentioned in SrI bhagavath gIthA 9.22 “ananyA:…” (being exclusively focussed on bhagavAn), whatever worship performed by such gyAnis is as good as worshipping bhagavAn only. Though brAhmaNa is one class of people, one would interact with them based on his family, vaishNavas are established by bhagavAn’s qualities, actions etc; in this manner, AzhwAr divides them as those who are immersed in his physical beauty; those who are immersed in his qualities and those who are interested in his divine actions, and desires them for their relationship and tells that “they are all my masters”. 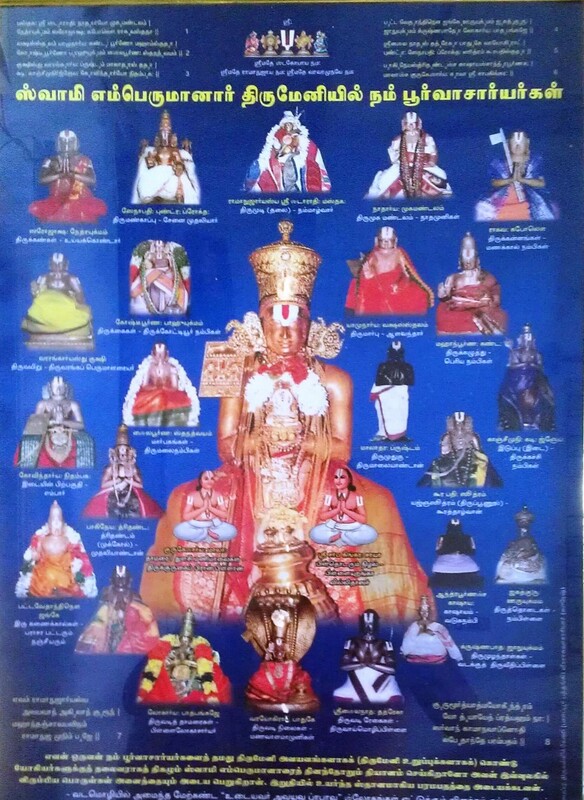 This entry was posted in thiruvAimozhi, thiruvAimozhi 3rd centum on September 26, 2016 by Sarathy Thothathri.